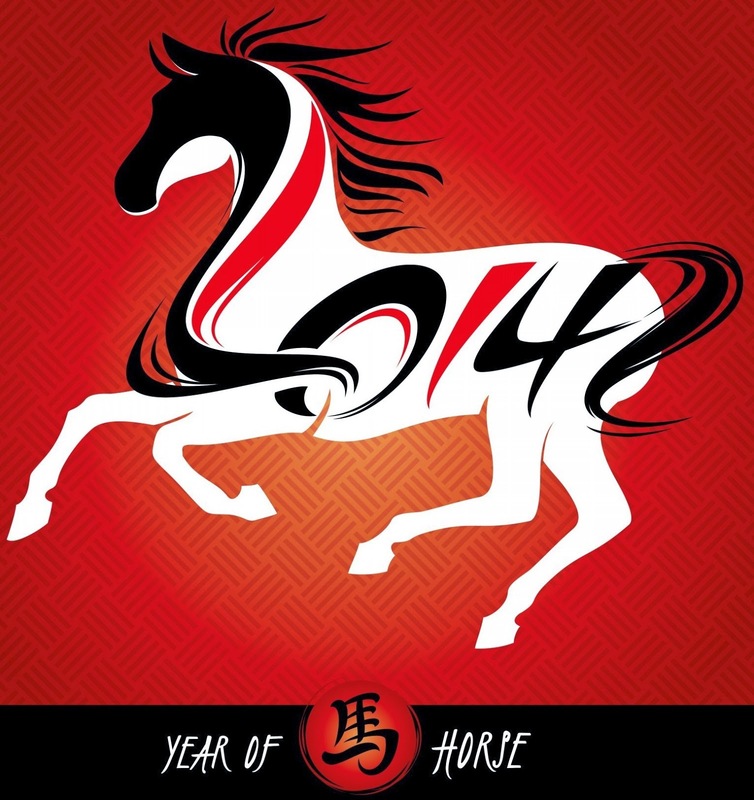 Today is the Chinese New Year and from today begins the Year of the Horse. The Chinese follow a lunar calendar and each year is dedicated to an animal. The association of animals to the years is based on an interesting legend. According to the Chinese mythology, once the Jade Emperor (the emperor in heaven) decided to call all the animals to his place to designate the years based on them. Only twelve animals responded to the call and priority was given according to their arrival at the finishing line what went on to be referred to as The Great Race. These animals were rat, ox, tiger, rabbit, dragon, snake, horse, ram, monkey, rooster, dog, and pig. In those days the cat and the rat were good friends! Since the cat was a late riser, it requested the rat to wake him up so that they could start early together. However, in the morning the rat was too excited about the race and forgot to wake up his friend, the cat. On the way, the rat met the tiger and the other animals like the horse, etc. who were much faster than himself. The rat worked a way out to reach faster than the other animals. The ox was an honest and straightforward animal. The rat approached the ox and wanted to know if it could hitchhike on it. The ox agreed provided the rat sang all the way. The two crossed the river and reached first and just when the ox thought that it had arrived first, the rat jumped ahead of the ox and was declared first! The tiger came in next followed by the rabbit who had hopped all the way and over a floating log. The dragon followed the rabbit and came fifth. When the emperor expressed his surprise at the dragon coming late as it could both swim and fly, the dragon explained that on the way it found a place which was suffering from drought, so it stopped for a moment to make rains and save the people from dying. The Emperor was happy to learn that and ranked it the fifth. (Dragons are rain-causing animals according to the Chinese mythology.) Some versions say that the dragon breathed hard on the log carrying the rabbit, so that the log reached the shore! The horse galloped all the way and even swam the river, but didn’t realise that the wicked snake was hiding in its hoof. At the finishing line, the snake jumped off the hoofs and seeing the snake, the horse jumped back in surprise and thus the snake was ranked ahead of the horse who came seventh. The ram, the monkey and the rooster took a raft and reached together and were ranked in the eighth, ninth and tenth positions. The dog came in eleventh as it had stopped by the river for a bath and the pig was sleeping till late and thus came in last, i.e. twelfth. The cat was too late and was very upset with the rat for not waking him up and since then it became the sworn enemy of the rat! The other animals either didn’t try or lost out since the race was over land and water and some of them couldn’t pass through both. One version says that the elephant tried, but gave up the race when the rat went inside its trunk! Many later versions of the above myth, ascribe the race to Buddha instead of the Jade Emperor, due to the influence of Buddhism, however what is important is that the story of the animals remains the same. It is said that each year is dedicated to an animal and it started with the year of the rat. According to the Chinese, people born in that year, tend to bear the characteristics of that animal. 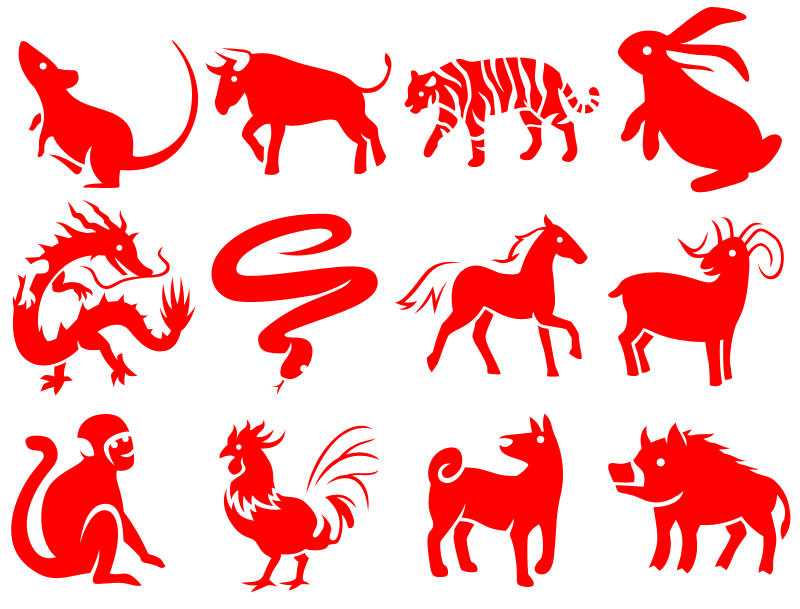 The Chinese astrology further divides each day into twelve two-hour zones which is further ascribed to each of the animals mentioned above. 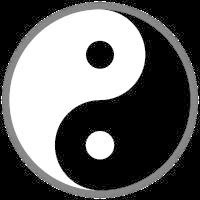 Yin-Yang theory. According to Hong Xun (960 - 1279), out of the twelve animals, the rat, tiger, dragon, monkey and the dog have five toes. Five is an odd number and belongs to the Yang side which is positive. The horse has one toe, again odd number and thus Yang again. The other animals all have toes of even number and thus belong to the Yin side which is negative. The snake does not have a toe, but its tongue is forked and thus has two ends, making it even again. Thus if you observe closely the animals have been arranged in the Yin and Yang order! 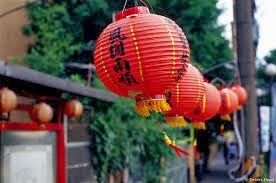 The Chinese celebrate the New Year by burning crackers and lighting red lanterns. The origin of this custom too is ascribed to an interesting legend. According to this legend, once there lived a deadly giant by the name of Nian deep in the sea and at the end of the year would come on earth and feed on human beings. To avoid being devoured by the giant, people would go up the mountains and hide. The giant would destroy everything on earth and leave if it didn’t find anybody to eat. Once an old man came to them and requested them not to leave as he would take care of the giant, if he was allowed to stay just one night. People tried to dissuade him from staying the night as it was the night of Nian’s arrival, but the old man would not listen. The people, not having faith in the old man, left for the mountains. That night when the demon came, he was greeted with loud firecrackers and red lights which scared the demon away. Next day when the people came down, they saw that their homes were intact and the old man had left. But they found the remnants of the crackers and red lanterns. 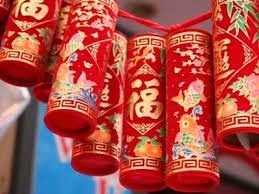 Since then, the Chinese burst firecrackers and adorn their homes with red lanterns and since then it was celebrated as the Passing of Nian, as ‘nian’ in Chinese means year. Here’s wishing all my Chinese friends a very happy New Year and may the Year of the Horse bring in all the positive aspects of the animal!! 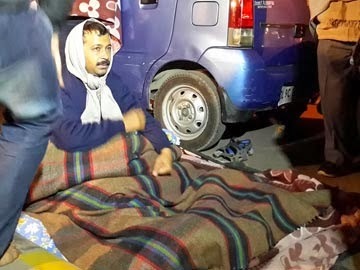 The recent ‘protest’ by the CM of Delhi has been called names, chief among them being ‘anarchy’. The CM is accused to have driven the state to an anarchical state by leading the protest. Friends and foes were up in arms about the means and the unconventional modus operandi of the protest. How can the CM force an established system to change ways? Are the state and its CM beyond the purview of the constitution? Has he not violated the constitution by taking his protest public when his prime job is to quash all public protests, which could have led to violence? I am appalled to say the least when I heard and read the ‘learned’ make such comments in such pompous and holier-than-thou attitude and words which were quite a mouthful, meanings for many made me scamper towards the dictionary. I am not learned enough to understand the jargon and matters around the Constitution, Republic, etc. I don’t know much about Governance as I have seen more of the lack of it, so let me refrain from commenting on the 9pm-intelligentsia. But what is beyond me is the raising of perfectly threaded eyebrows to certain issues. What are people upset with – is it David unsettling the Goliaths or the unconventional means of protest? As far as the confrontation of the fledgling political outfit of a David with the established political parties with all the paraphernalia at their beck and call – the world has seen the outcome and people are rejoicing at some glimmer of hope on the horizon. We have seen many instances of overconfident giants being relegated to defeat by relatively unknown or minor entities who stood no chance prior to the confrontation. What baffles me the most is the hue and cry on the unconventional method of protest. Since childhood, we have been exposed to many unconventional methods of protest and none have bothered to question them. When Gandhiji first mooted the idea of burning the ‘passes’, an obligatory identification document for all non-South African citizens in Johannesburg, wasn’t that against their constitution? When he further advised people to protest non-violently, wasn’t that unconventional? When he advised equality of all castes, wasn’t that against the then social order? When he suggested protests by burning all foreign imports, wasn’t that against law of the land? I can go on, but what is important to realize is that it was exactly these unconventional methods of protest that ushered in a change and need I mention, change for good. Mythology too is witness to many an unconventional methods of protest. Sati jumped into the sacrificial fire to protest against her husband, Shiva’s insult. Today people will call it suicide, but then it was unconventional even for the gods, and it was so disturbing to Shiva that he literally lost his cool! In Ramayana, towards the end, when Rama is united with his sons, it was hinted to Sita that she should prove her chastity once again. Sita protested against the unfairness and decided to find refuge in Mother earth than submit. Wasn’t this an unconventional protest for a woman who had stood by every said and unsaid norm of the then society? Didn’t she question the laid down societal norm or convention? Conventions lead to status-quo and a state of complacency for any establishment. While the unconventional disturbs the fabric of order, it does set in new rules of the game. Martin Luther King had once said, "One of the great liabilities of history is that all too many people fail to remain awake through great periods of social change. Every society has its protectors of status quo and its fraternities of the indifferent who are notorious for sleeping through revolutions. Today, our very survival depends on our ability to stay awake, to adjust to new ideas, to remain vigilant and to face the challenge of change." While the ‘protectors of status quo’ are up in arms, I am sincerely hoping that ‘fraternities of the indifferent’ will rise to the occasion, since ‘our very survival’ depends on our ability to accept this ‘challenge of change’. While I am not holding a brief for the new David on the block, I do think that the nation needs a revolution. We need a change and change is what we need. When a child is born, it causes unimaginable pain to the woman, but is the most joyous moment for the mother. 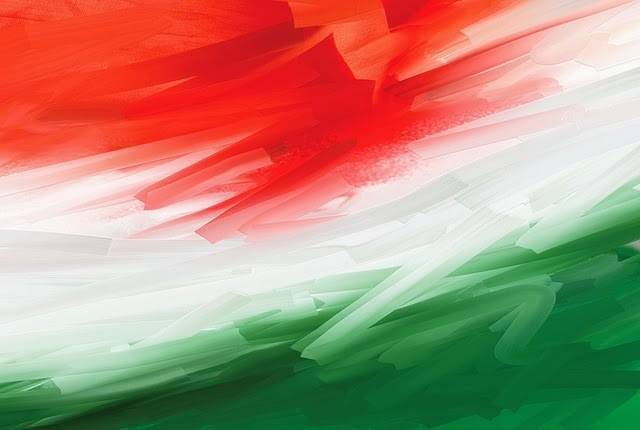 On this Republic Day, we as citizens of India need to take a call, we want to endure like the woman in pain or enjoy like the joyous mother – a little discomfort notwithstanding. In the previous part we read about the love story of Nala Damayanti, how they met, married and separated and met again to live happily ever after. Let us look at the significance of this tale and its placement from a narrative perspective. When Yudhishtir had lost his kingdom and he was sent to exile for thirteen years along with his four brothers and Draupadi, he was suffering from extreme self-pity. He could not reconcile with what he had done and how his actions had led to the pitiable state of his brothers and wife. It was important to bring him out of the self-pity mode and have him overcome this grief, which was being made evident in his brother’s eyes and Draupadi’s untied hair. While in exile Sage Bhardwaj comes to meet the Pandavs and in his moment of self-pity, Yudhishtir asks the sage, if there was any king before him, who was as unfortunate like him, who had lost his kingdom and everything and was driven out to exile. He felt that there was none as unfortunate as him and though he followed the path of Dharma, he was in such a sorry state. It is at this stage that the sage tells him this story and makes him realize that he was still better off, as he had his brothers and his wife with him, while Nala was all alone. 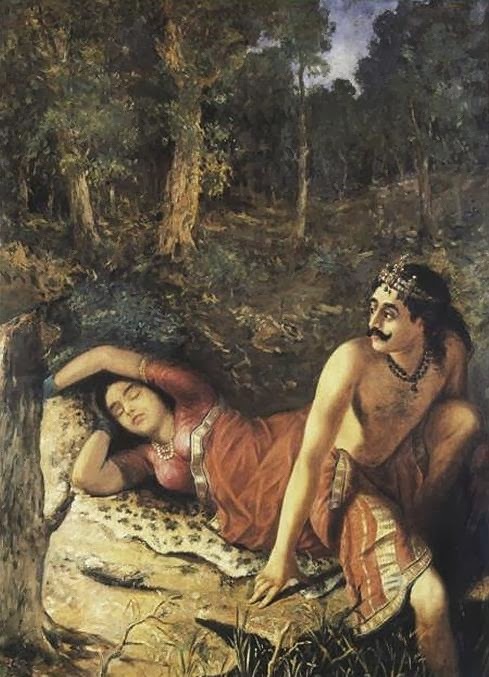 The similarities between Nala and Yudhishtir were quite striking. Both had beautiful wives, both had a weakness for the dice and both were not very good at it and both lost their kingdoms in the game of dice. In the case of Yudhishtir, the dice were doctored by Shakuni and in the case of Nala, Kali had played foul. At the end of the game, both are driven to exile, while Nala spent twelve years in exile, Yudhishtir had an additional year. Nala became the charioteer of the King of Ayodhya and Yudhishtir became the personal assistant of King Virata. What is equally significant is that during exile both Nala and Yudhishtir master the skill of playing dice with the respective kings that they were serving. Nala’s disfigurement could be seen as similar to the last year of disguise that Yudhishtir had to undertake while serving King Virat, just as Draupadi was serving the Queen in disguise similar to Damayanti serving the Queen without their knowledge of who the two ladies were. It is said that when Nala lost everything at the game of dice, his brother had suggested that he stake Damayanti, but Nala declined. While here Nala differs from Yudhishtir, Nala still does stake Damayanti later. Both do stake their wives, one out of sheer desperation, while the other out of confidence; one when his was weak while the other when he was strong in the game. According to Dr. Pradip Bhattacharya, a prolific writer on Mahabharata, the tales have an important difference. The tale of Nala Damayanti is a pure romance with all the romantic trappings. It stands out to be a stark difference from the original flow of the epic, especially in the treatment of Damayanti and Draupadi. While Draupadi’s character is strong and determined, Damayanti comes out as a soft and a quiet woman, thought she occasionally does display the typical traits of a ‘Vyasan’ woman, like when she refuses the gods to marry Nala. This could be a case of the story being told by a young Vyasa! The initial wooing through a swan, the magical powers of Nala the pining of Damayanti, are all a case of a classic romantic tale and that sure does make a significant diversion from an otherwise mature tale of the Pandav’s in the epic. The tale of Nala Damayanti has been rewritten in many forms as standalone romance and I too came across the tale as a romantic story that warmed the cockles of my (then young) heart!! But as I mentioned at the beginning of the article, one shouldn’t miss the significance and the positioning of the story in the epic, which had its own rationale in the narrative. The story of Nala Damayanti was probably the first mythological story I read as a child, way back (really way back!). For me, then, it was a simple love story from mythology. A recent reading however, turned out to be much more than a simple love story. But first the story. Vidarbha and was known for her beauty and virtues. Once Nala caught a golden swan, but before he could do anything, the swan cried out asking for his life to be saved and in return, it would sing praises of Nala to Damayanti and make her fall in love with him. Damayanti was well known for her beauty and it was rumored that even gods wanted to wed her. Nala released the swan. The swan went over to the palace of Damayanti and sang praises of Nala, as to how he was the most handsome man on earth and so on. Soon the swan became the carrier of messages and to cut short the story, both fell in love with each other, without having met in person. Soon Damayanti’s father decided to hold her swayamvar, to which kings from far and near were invited, including Nala. On the way to the swayamvar, Nala met the gods, Indra, Agni, Varuna and Yama and they insisted that he ought to convey to Damayanti and she should select any one of them for a husband. Nala tried to decline, but was forced to do so. Nala communicated the message to Damayanti, but she was determined that she would choose Nala only. When Damayanti came with the garland to choose her husband, she noticed that there were five of them looking like Nala, as the four gods had decided to change their appearances, to confuse Damayanti. Damayanti understood that this was a ploy by the gods, but she also knew that man was not perfect like the gods. Some versions say, that she noticed drops of sweat on one of them, and thus knew that that was Nala, while some versions say that the real Nala was the only one blinking his eyes. Anyways, Damayanti got married to Nala and the rest departed. While the gods were leaving, they came across a demon by the name of Kali (also a personification of the Kali-yuga), who was late for the swayamvar and was both angry and disappointed to know that Damayanti had selected Nala. He could not bear to hear this and decided to avenge this insult! Nala had one weakness and that was playing dice. While he was not very good at it, he could not resist playing the game. After Nala’s father’s death, he had become the King and conducted Ashwamedha Yagna and expanded his kingdom. Nala’s younger brother was getting jealous of Nala’s fame. Seeing an opportunity, Kali instigated his brother to challenge Nala in a game of dice. His lack of expertise in the game, but the addiction to play on, cost Nala of everything that he possessed and was soon banished from the kingdom with his wife. All this aided by Kali who had taken the form of the dice, unknown to both the brothers. Nala and Damayanti sent their children to Damayanti’s father, and left the kingdom without anything, except the clothes that they wearing. One day, Nala’s loincloth too was taken way by the birds when he was trying to use it to ensnare them. They were left with Damayanti’s saree to cover them, which limited their movements. It was nearly three days since they had last eaten any food and Nala realized that it was unfair to have Damayanti suffer because of him. He urged Damayanti to leave him and stay with his father, but Damayanti would not hear about it and wanted to stay with him and bear the hardships together. Nala realized that she would never leave him and things would only get worse as time went by. One night when they were sleeping, Nala tore off a portion of the saree to cover himself and left her alone at night, hoping Damayanti would join her father. When Nala was going his way, he found a snake on top of a tree which had caught fire. Nala saved the snake and as soon as it was out of danger, it bit him which changed Nala into a dark and hunchbacked person. A surprised Nala wondered if this was the way, the snake preferred to repay his kindness. The snake said that it had bitten him for his own safety. The changed look would act as a disguise for him enabling him to get some work, as none would hire Nala as he was. The snake also gave him an ornament, which would bring him back to his original form by wearing it whenever he wished to. When Damayanti woke up and found herself alone, she was disturbed. As she started walking, she came across a demon who tried to attack her. When Damayanti bravely resisted the demon, the demon showed his true self as a god, who was testing her. The god blessed her and told her that she would unite with her husband after twelve years. Damayanti did not go to her father’s place but took up the job of the queen’s maid at a nearby kingdom. Nala too found a job as a charioteer to King Rituparna of Ayodhya. Many years passed and Damayanti’s father found Damayanti and brought her home. He decided to hold a swayamvar for his daughter once again. The king that Nala was serving decided to attend the swayamvar and brought Nala along with him. At the swayamvar, Nala wore the ornament given to him by the snake and assumed his original looks and was thus garlanded by Damayanti. Later Nala challenged his brother to another game of dice luring him with the promise that he was willing to stake Damayanti if he accepted the challenge. Nala had by now become adept at the game of dice, which he had mastered by playing with King Rituparna. In the game of dice, he managed to defeat his brother and gain everything back. The above is probably the most unromantic version of a supposedly romantic tale from the Mahabharat and the reader needs to pardon me for that! Also, it is a brief version with lot of juicy details left out. What is important about this tale is the timing of this tale being told and to who and why. 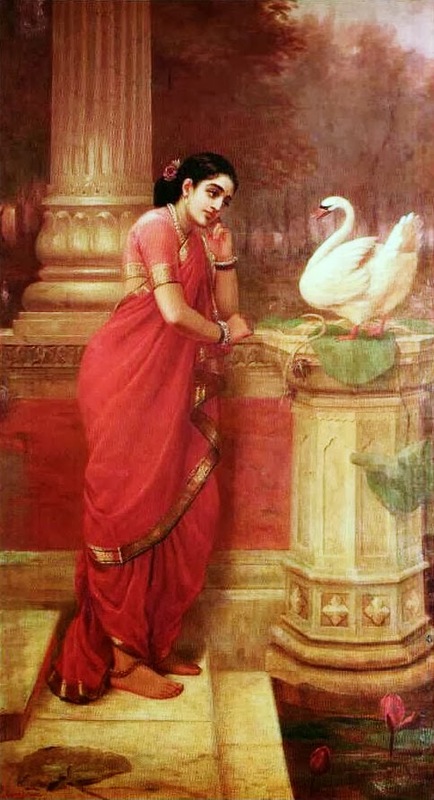 The above pictures are of the "Nala Damayanti" series of paintings by Raja Ravi Varma, Wikipedia.